I have a little confession to make. When we moved to London in June last year, we were struck adrift with no access and indeed no funds to a gymnasium. As yet the ‘Heathrow injection’ as they call it had not yet hit and we did not want our waist lines to get any bigger. AT was investigating the art of body weight work outs and I was jogging the beautiful parks and commons of the Clapham/Battersea area but we needed more than just some exercise. AT discovered the Paleo Diet while researching body weight regimes. He said he’d like to try it. But because of its restrictive nature, I scoffed. A lot. But he did a lot of reading and he even bought a cook book and I figured that it can’t hurt to give it a go. I’m always interested in ways to keep the weight down. Essentially going Paleo means removing all of the things from your diet that the Paleolithic man would not have had access to because at that time there was no agriculture. This includes grains, legumes, beans, dairy and potatoes. I know, it’s insane. But I was willing to compromise. I had already started cutting out carbs at lunch time, and so all it meant was that I would now cut carbs at dinner time. But as many of you might know, this is not so easy. It means no rice, no pasta, no flour, no breadcrumbs, no bread and nothing creamy or beany. If you want to read more about the Paleo diet, please do, but we found it too limiting right off the bat. So instead we compromised to removing grains from our diet, and white potatoes. We are trying to reduce our intake of high GI carbs and increase our vegetable intake. It’s not Atkins, we don’t eat bucket loads of meat, we eat the usual amount of meat we always do, which is about 150g per dinner. Rather what we’re trying to do is fill up on masses of vegetables instead of grains and potatoes. This is a concept you will find repeated again and again in nutritional advice. I imagine it works because we simply don’t require the amount of fuel that grains and high HI carbohydrates give out. Most of us sit at our desks all day. Once I got my head around it – which did take some time – I am very much enjoying our new evening meals. It’s been over 6 months now and we’re still going and I am expanding my repertoire everyday. I do admit that I did not give up my old habits easily. I got frustrated trying to re-think meal plans that had served me well for ten years. But it’s a work in progress. I have discovered the joys of Yotem Ottolenghi’s lentil dishes and I am going to embark on a massive food exploration of middle eastern cuisine this year in my attempts to break the western habits of carb loading. I love chickpeas and lentils and the spices used in Turkish and Lebanese cuisine and I want to try to incorporate some of these things into my diet. So now that my little secret is out, I thought I might share some of my favourite carb reduced meals if you’re looking to drop a few kilos or even just shake up the routine a bit. I’ll start with a dish you can eat with a piece of meat, like salmon or a pork chop for example. I found this recipe in a book I reviewed for Foodepedia, from a chef called Maria Elia. Funnily enough she got this recipe from Neil Perry’s Rockpool in Sydney. It’s called Aubergine Mull. That’s eggplant to an Aussie. But it seems Australians could be the only people in the world who call it an eggplant. So lets get continental and use the much more elegant sounding, aubergine. Quickest way to peel tomatoes is to pour boiling water over them in a big jug or bowl. Leave them for five minutes and the skin will come right off. 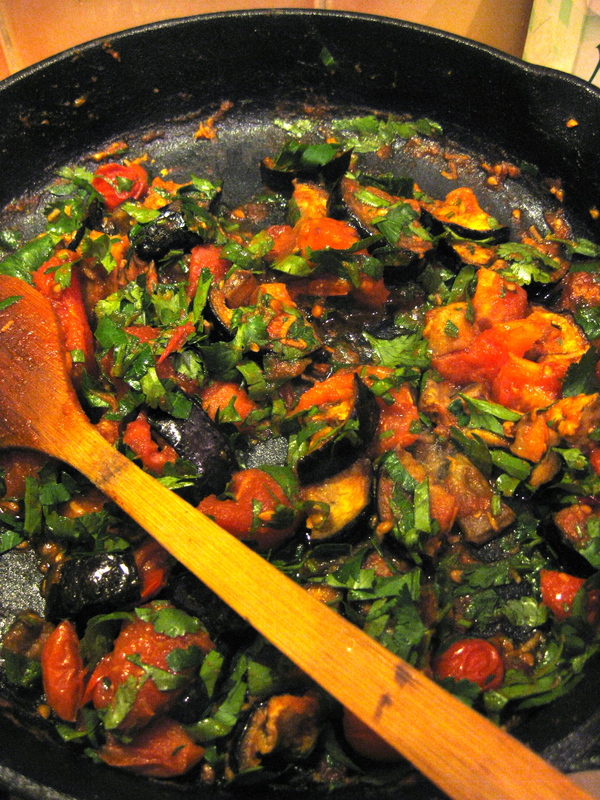 This recipe asks you to fry the slices of aubergine in oil. I prefer to roast mine in an oven for half an hour or so. Bit less fatty and as any aubergine fan knows, they soak up the oil like crazy! Fry the garlic in some oil in a pan, and add the tomatoes and spices. Cook for about five minutes. Add eggplant, cook for another few minutes. Turn the heat off and add lemon and herbs and season to taste. This dish is really good – with everything. I love it!